When I looked at the map, there was a fairly large island connected by bridge to Fukuyama by the name of Tashima. Another bridge from there led to Yokoshima. Thus I decided to stretch my legs a bit and step out on an excursion from Fukuyama to these two locations. The Utsumi Ohashi Bridge that connects the mainland with Fukuyama was installed in 1989. Utsumicho came into being when Tashima and Yokoshima were amalgamated. The core industry is fishing. In particular, the area boasts the greatest nori production Hiroshima Prefecture. Just hearing they have tasty things to eat there makes me want to head off to places I’ve never been. It takes about 50 minutes by bus from Fukuyama Station. I arrived in Utsumicho after crossing over the L-shaped Utsumi Ohashi Bridge. First off, I found a place to get some lunch, namely the diner“Sencho-san”. I thought that maybe the owner must have been a ship’s captain at one point (“sencho” is captain in Japanese), only to find upon opening the door that the one in charge was in fact a group of local ladies. Side dishes from the items within a glass case. Alongside pickled and simmered fish, I spotted some perfectly browned seasonal sanma. The regular customers inside were already dipping into beers thought it was still the afternoon. My guess was that they must have just finished working from the early hours of the morning, and the way the women said “Pace yourselves” with exasperation at their high-spirited shouts “One more!” was quite amusing. The fishing in the area is apparently done with fixed nets set on paths the fish travel around the coastline, and trawls, which involve lowering a pouch-shaped net to the sea floor and dragging it along to catch fish that dwell near the bottom. I wondered what kind of things they caught in their hauls. A peek into the crawl of Kaneto Fisheries showed me various sizes of shrimp, squid, octopi, and fish that I had never seen in a supermarket before. This was apparently where fishermen from all over the Seto Inland Sea bring their daily catches. And older gent asked me if I wanted to buy something, but I had to decline since I was still in the middle of my trip. More strolling about the village brought me to a shop bearing the name interesting name of Paintings and Tea Terere. It was a gallery/tea house located within a remodeled home. Inside were many pictures of the sea. “I painted them all myself.” I turned back to find an old man standing there with a grin on his face. The proprietor, Mr. Kenichi Ogawa, said that he moved from Kyoto to Utsumicho out of a desire to paint the sea. “Come over this way,” he said, and when I followed him, I came upon a place that looked like a secret fort stretching out from the veranda. The sea was visible through the gaps between the trees. There’s also a manga room on site. As Mr. Ogawa said, “I get a lot of kids coming through here. 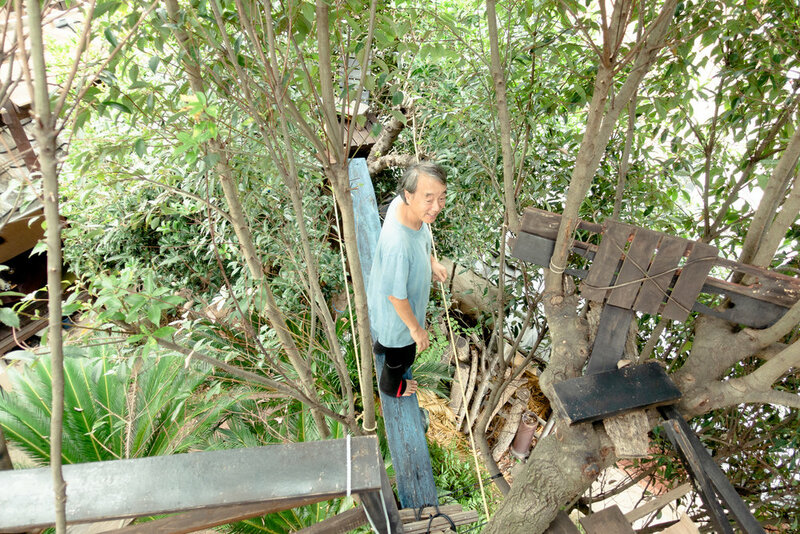 When they ask me why I do what I do, I tell them that it’s because I enjoy it, of course.” In between projects, Mr. Ogawa apparently makes playground equipment for the neighborhood kids. Grownups with an adventurous spirit really are the coolest. In the shop, I enjoyed some tea and snacks made by his wife Maria Ines, who is Argentinian. “Try some if you’d like” she said as she offered me some Alfajores, a traditional Argentine snack. Composed two cookies held together by Dulce de leche, they are very sweet and sure to become a favorite. Hopping back on the bus, I traveled alongside the sea to the Uchiura District in between the mountains and the water. “Since I’m here in a fishing town, I may as well learn how to work with fish before I go.” The locals introduced me with this desire of mine to Minshuku Asobi. While I could have easily called it a day and headed back to Fukuyama Station, I figured that since I was there I may as well spend the night on the island. This inn situated in a renovated home built 200 years ago has a hearth in the center as is simply amazing. That night I would have a fisherman’s wife teach me how to make whole fish sashimi with sea bream. My teacher was Mrs. Okada, who once rode upon a fishing boat alongside her husband. She brought out some fresh sea bream. The first order of business is to remove the scales, then dispose of the gills and innards. 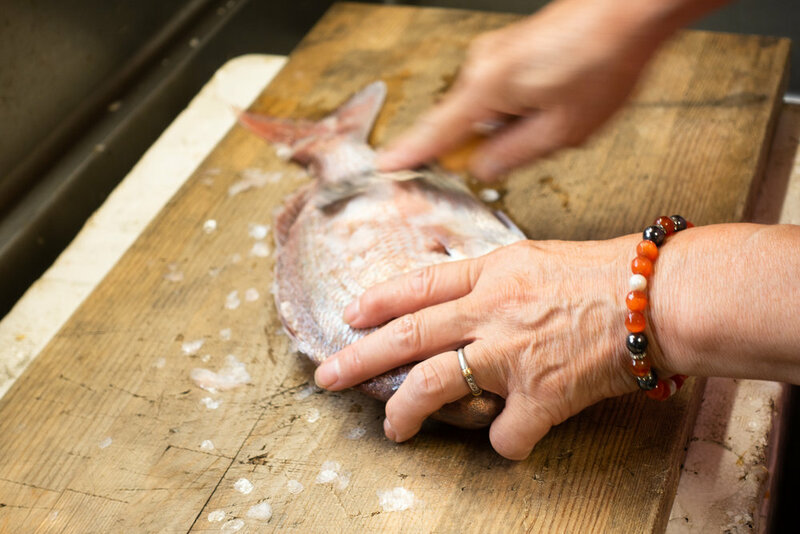 The fish is then pared down into three slices, from which the skin is removed before making them into sashimi with careful draws of the knife. Then they are ready to be served. Despite my clumsy fingers, I somehow got the job done with Mrs. Okada’s help. Freshly prepared sea bream is chewy. I also sampled miso soup made with the remaining bony parts of the fish, as well as dried mackerel. 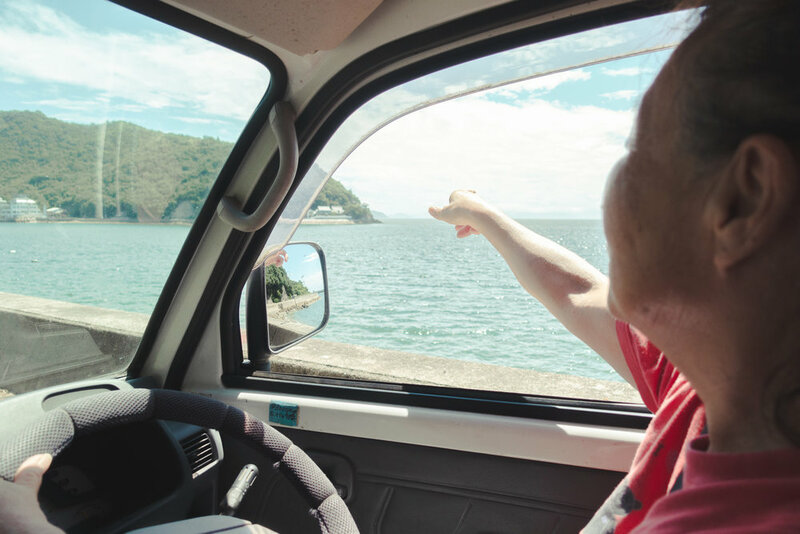 The next day, Mrs. Okada took me on a drive along the sea. Heading down the mountain, we entered a small, round bay that unfurled as if to embrace the sea. But, Mrs. Okada took a liking to the fresh fish caught in Utsumicho the more she ate them. She apparently got a firsthand feel for the richness of this island during her days here. Mrs. Okada also brought me to Maruko Fisheries. The owner, Ms. Kaoru Kubota, inherited the family business of homemade nori, then opened a store, where she also handles production. When I bought some of the first harvest of ichiban nori, Ms. Kubota told me that it tastes great cooked on toast with cheese. 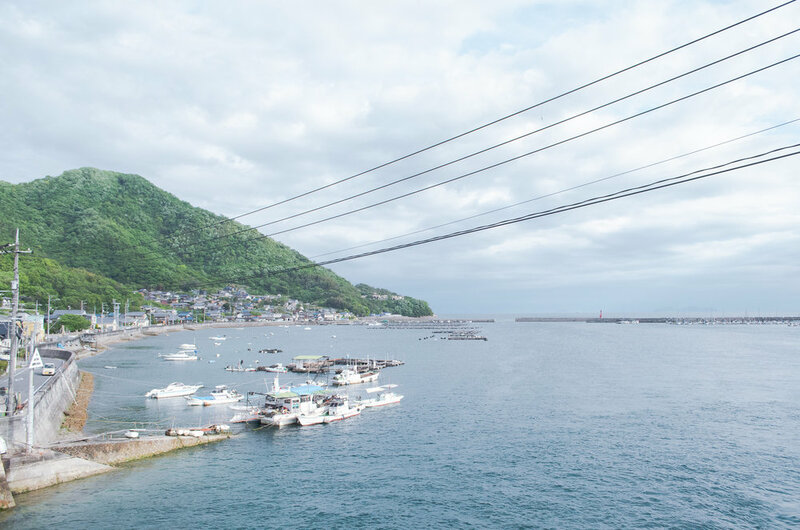 While having the Utsumi Ohashi Bridge has made things more convenient, people say the flipside of this is that the number of those who leave the islands has gone up, and thus thinned out the culture. Regardless, there are still folks here willing to share their proud scenery and customs with open arms. This was a short trip from Fushimicho about an hour one-way. A fun jaunt to islands where you can encounter tasty food and cool locals.